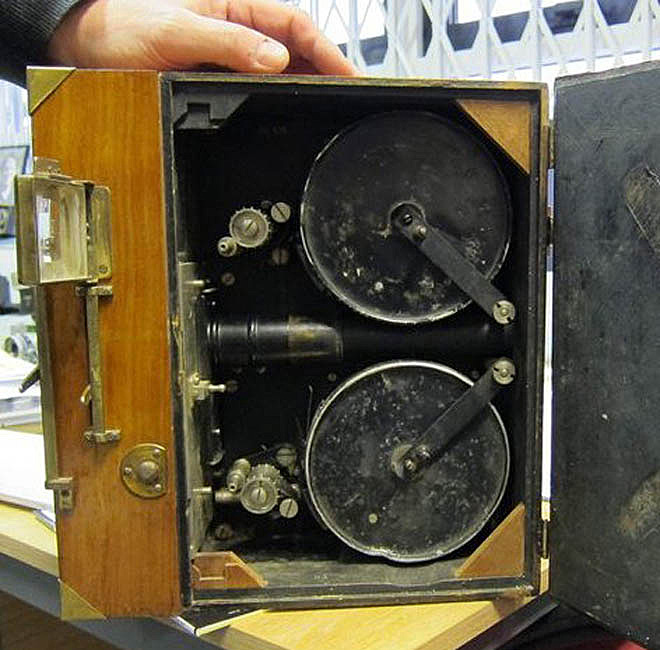 This antique camera, used to make short film Londoners, was found in a British warehouse. In his quirky new short Londoners, director Joseph Ernst uses a hand-cranked camera from the 1920s to film contemporary city dwellers as they might have been portrayed during The Artist‘s glory days. The British filmmaker got inspired after discovering vintage documentaries by Mitchell and Kenyon, who chronicled everyday life in Edwardian England during the early 1900s. As seen in the exclusive silent premiere of Londoners above, the answer is a black-and-white “yes.” Soccer fans, cafe loungers, subway crowds and parade-goers peer into the camera as though from an earlier century, lending the group portraits an eerily timeless quality. TECH SPECS Camera: The Ertel Filmette was manufactured in Germany between 1910 and 1920. “We needed a camera manufactured after 1909, which is when they standardized film gauges,” said Joseph Ernst. Before 1909, cameras used film sizes that do not exist today. Lens: The camera’s original 50mm lens was used for the entire Londoners shoot. Tripod: Vintage tripods proved too fragile, so Ernst used a heavy Ronford that had to moved with a trolley. Film stock: 35mm Kodak 5222. Film cartridges: Ernst chopped up a now-standard 400-foot reel of film stock into three 130-foot sections to accommodate the camera’s relatively tiny magazine. Londoners isn’t Ernst’s first experiment in offbeat cinema: For his previous short film, Feeder, he poked a camera down the esophagus of a willing subject to record exactly what happens when humans swallow food. His less-invasive follow-up became an interesting essay on today’s world, as Ernst trundled a bulky antique camera onto city sidewalks crawling with wannabe smartphone documentarians. Londoners owes much of its flickering charisma to a wooden, 18-frames-per-second camera — circa 1915 — that Ernst discovered in a warehouse full of antique filmmaking gear managed by David French. “I would never have got this kind of footage with a digital camera,” said Ernst. Propped on an enormous tripod next to a “changing tent,” the bulky contraption made a sidewalk spectacle of itself — which is precisely what Ernst was aiming for.